Foreign language music isn’t something I’d normally listen to, and definitely something I wouldn’t normally think about reviewing, but after reading a review of ‘Verden Er Enkel’ in Rocksound last month I felt obliged to give this album a try, and I’m glad I did. According to Google translate ‘Verden Er Enkel’ translates to ‘The World Is Easy’, and since I don’t speak Norwegian I’ll have to assume that’s right. 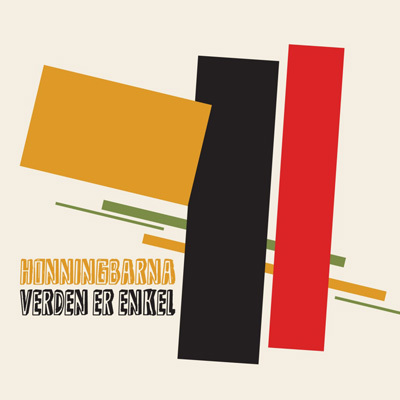 Musically, Honningbarna do make it look very easy, as ‘Verden Er Enkel’ is a great punk album, even if I can’t understand a word of it. Instrumentally speaking, it’s spot on, being riff heavy, fast and energetic. It rarely slows down and maintains a frantic pace throughout, making use of harsh vocals and gang shouts to add to the tempo as well as adding another dimension to the music. Vocals are on point, being very strong, and the fast drums and chugging riffs complement them perfectly. The use of children to provide extra vocals is a nice touch as well, contrasting the guttural shouts of Edvard Valberg. First track ”Dodtid’ is an explosive opener reminiscent of ‘Refused’ and is a great start, raising the bar for the following 12 tracks, which don’t disappointing either. The majority of tracks on ‘Verden Er Enkel’ clock in at just over two minutes, and as you’d expect these 2 minutes are relentless, chaotic punk at it’s finest, ranging from chugging bass and vocals to full on assaults as the songs progress. Even if you don’t understand the lyrics you can still appreciate the talent Honningbarna possess and pour into their music at every opportunity. Think the recent ‘Gallows’ self-titled in a foreign language, it’s great. ‘Verden Er Enkel’ is punk rock at it’s finest, and shouldn’t be overlooked as a result of the language barrier, as to do so would be missing out on a great record.